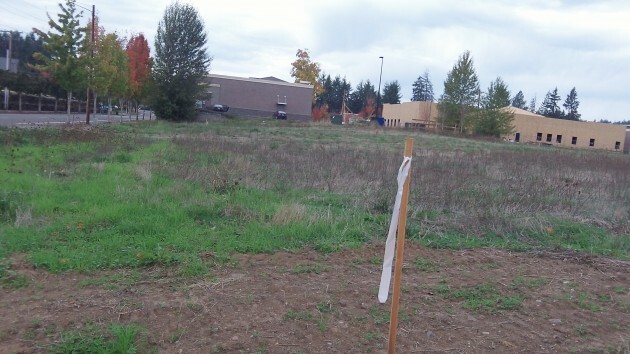 Samaritan plans to put up two medical buildings on this land near the Corvallis Clinic and a new dialysis center on Hickory Street in North Albany. Soon it won’t be an overstatement to refer to the Hickory Street Health Care Complex in North Albany. Already the address of a branch of the Corvallis Clinic, a Samaritan medical building, and a Fresenius dialysis center under construction, the street will soon have two more Samaritan Health Services buildings. On Oct. 19, I reported that Samaritan had filed for preliminary permits on 6 acres at 435 Hickory, on the north side of the street just east of the North Albany Village shopping center. Now I’ve had a chat with David Triebes, CEO of Samaritan Albany General Hospital, about what Samaritan is planning there. The plans are for two buildings and related site work to take up about half the property. In Building 1, about 20,000 square feet, Samaritan plans to consolidate its Heartspring wellness program, now housed in Corvallis and at the Geary Street Clinic in Albany. (The program combines conventional care with “the best of complementary medicine” including mind-body therapy, massage and acupuncture, its website explains.) The other half of the first building will have a medical clinic whose exact nature has not yet been decided. Samaritan hopes to start construction shortly after Jan 1 and open the building by July 2016. The second structure, between10,000 and 20,000 square feet, is intended to house the Urgent Care clinic now operating on the third floor south of Hickory Street. Samaritan thinks it’s important to have the walk-in clinic on the ground level, and the clinic also needs more space. The Geary Street Urgent Care will stay where it is. Triebes anticipates the second building will be done by November 2016. Buy Cialis online from https://surgicaleducation.com/cialis-20-mg/ by canadian licensed pharmacies. Samaritan has budgeted between $6 million and $7 million for each of the two buildings, including site work, parking and all the rest. T. Gerding of Corvallis will do the construction. What’s driving all this expansion in the Samaritan system, which operates numerous clinics and the hospitals in Albany, Corvallis, Lebanon, Newport and Lincoln City? The main factor is health care reform on the state and federal levels, Triebes told me. The reforms have given many more people access to health care while also vastly increasing the administrative and record-keeping requirements. This is great news. More people with health coverage means more demand for services. And people getting health services they could not get before should result in healthier people. My wife recently got health coverage through her employer. She’s in an entry level job that pays little. Affordable care? You have to be joking. The deductibles are at least 5 times what she’s paid doctors while uninsured in the two years she’s been in this country. She gets no practical benefit. She pays cash, without the cash discount until her deductible is met. The only way that happens is if she gets a serious illness that requires expensive treatment or hospitalization. Health Care savings accounts work better. But you likely don’t know about that with your PERS retirement package? The other problem is establishing herself with a primary care physician. We can’t recruit new doctors fast enough in this town and it’s been this way since long before Obamacare got RAMMED through Congress without a single Republican vote. And remember what Nancy Pelosi said about Obamacare on the eve of it’s “passing”? : “We have to pass the bill to see what’s in the bill.” Defend THAT, Bob. There’s democracy in action for you. Our founders are spinning in their graves.